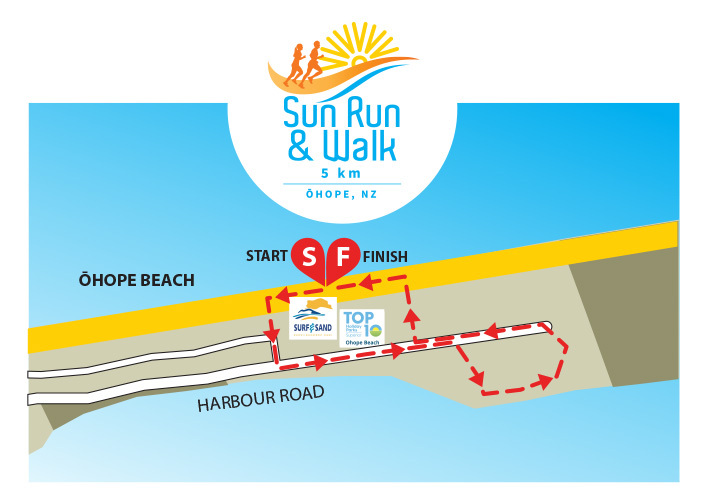 Starting on the glorious, sweeping sands of Ōhope Beach, competitors taking on the 5km challenge will be charmed by this scenic beach inspired course. Heading west up the beach to the beach access to Anne St and up to the junction with Harbour Road. Participants will continue along Harbour Road into the Port Ōhope Recreation Reserve before turning right onto some easy going coastal tracks through the reserve, completing a short loop before heading back on to Harbour Road. The final section will see entrants turn right onto to a beach access track, before completing the final 1km run on hard-packed sand to the finish line inside the premier Surf & Sand Beachfront Venue. The 5km comprises approximately 65% off road terrain and 35% on road. This is an open event with run or walk options. Courses have been officially measured. Maps are indicative. Elevation profiles coming soon.